A cassette air conditioner operates very similar to a wall-mounted split system air conditioner. The major difference is that cassette air conditioning is installed in the ceiling as opposed to mounted on a wall. Cassette units sit snugly in your ceiling rather than taking up wall or floor space. They distribute conditioned air from the side panels of the ceiling cassette air conditioner, which can have between two, three or four outlets. The system’s unit is mounted outside, similar to how a conventional split system air conditioning unit would operate. At The Cool Shop, we carry the latest range of Daikin and Toshiba ceiling cassettes for the Sunshine Coast. The cassette air conditioning system is an attractive solution for false ceilings. The systems are quiet and energy efficient and have an adjustable airflow distribution system for ceiling heights up to 4.2 metres. 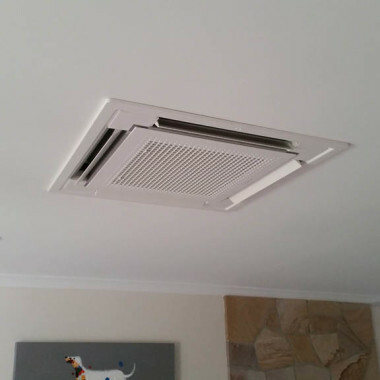 This makes Daikin ceiling cassette air conditioners ideal for Sunshine Coast commercial air conditioning needs, as they operate from such a height without any noticeable loss of effectiveness. Daikin cassette air conditioners feature ‘home leave operation’. This setting means you can leave the house and the system will save energy while you are gone but continue cooling. Ceiling cassette air conditioners also have draft prevention technology which avoids soiling of your ceiling. And the system has draft free operation with horizontal discharge, while it distributes air efficiently and evenly via the vertical auto swing function. This function also provides individual comfort. Daikin cassette air conditioners provide comfort without disturbance with their quiet operation, while an optional flap shut-off allows for easy installation in corners. You can also have your choice between wireless or wired controllers. 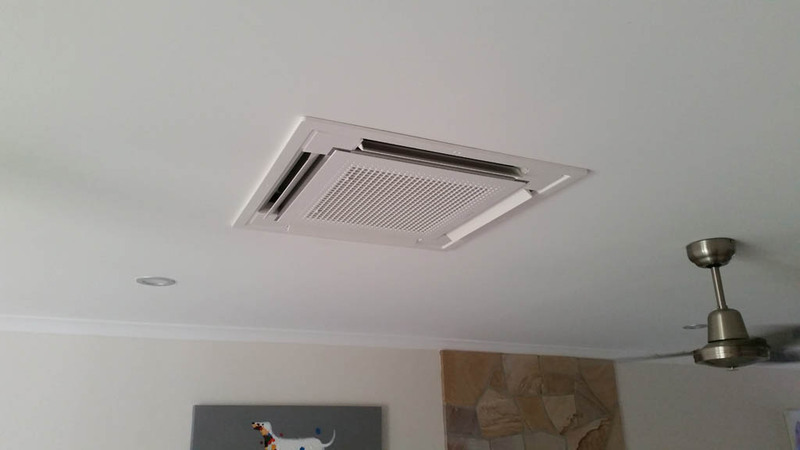 Cassette air conditioners are more suited to Sunshine Coast properties or commercial spaces where wall-hung split systems, or other air conditioning systems, may not be possible or feasible.